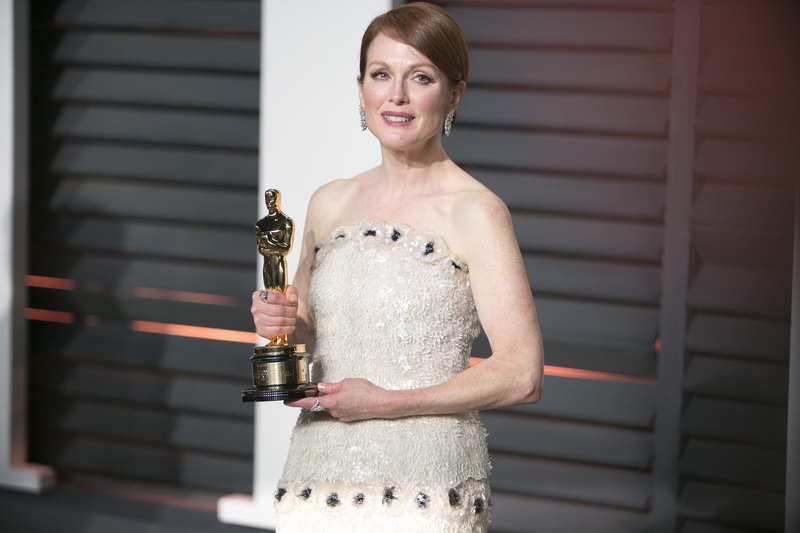 Julianne Moore picked up the Best Actress Oscar on Sunday night, deservedly so, for her role in Still Alice. Julianne Moore looked gorgeous in her Chanel Haute Couture dress, which was champagne hued, strapless, and column-shaped. The gown, which began as a sketch done by Karl Lagerfeld himself (not unusual for a custom made piece from the design house), has some secrets and an interesting backstory. The finished product was a mix of the original sketch and a Chanel runway show dress that the redhead stunner saw and loved. As WWD reports, actresses attending the Academy Awards usually stick to one or two choices, so a top choice and a backup option — remember in 2013 when Anne Hathaway, who swapped out her Valentino dress for an underwhelming pink Prada gown when she found out her planned frock was too similar to the one Amanda Seyfried would be wearing and it became #Dressgate? Anyway, two is a manageable number of dress choices, as designers have to create and alter the gowns. They can't really be on call to customize late in the game, either, because they have runway shows to prep for at the same time and it's not feasible to create a gown "just 'cuz" due to the many hours that go into it. Plus, having several options can create too much back and forth for an indecisive fashionista on her big night. Moore's gown is actually the product of two ideas and here are three amazing facts about the dress she wore when graciously accepting her statue. Moore and stylist Leslie Fremar said "yes" to the dress immediately, upon seeing Lagerfeld's sketch, even though they couldn't conceptualize it IRL. That's daring in and of itself, since they couldn't translate the dress in their minds. But they had faith in one of fashion's biggest talents! When Moore saw a dress she loved at the Chanel Couture show, Lagerfeld went back to the drawing board, revising his sketch to include elements of that other dress, further customizing her look to her specifications. The sequins on the dress were hand-painted! Talk about time-consuming couture. That type of handiwork is why couture is worth more than the GDP of some small countries. Lagerfeld himself was thrilled that Moore won while wearing one of his creations. He was a bit gushy, saying, "She is the perfect illustration of what I understand to be womanhood in the best sense of the word." Moore certainly looked feminine and beautiful in her truly custom Chanel dress. And just FYI, in case you erased it from your mind, here's A. Hath's ho-hum pink Prada. It created faux "headlights" and was so simple it was snooze. This is what Amanda Seyfried wore, which was apparently too similar to the dress her co-star wanted to wear, leading to the switch. Dressing for the Oscars is quite an undertaking, judging from both these anecdotal stories!